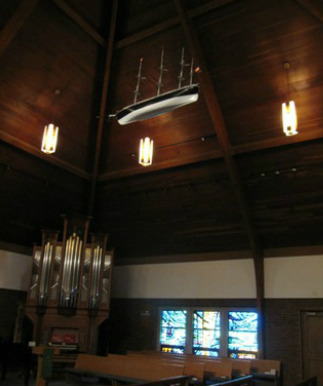 The Danish custom of hanging the replica of a sailing vessel in the church sanctuary is widespread in Denmark and in churches of Danish origin in America. It has two sources of origin. The custom of giving the replica of a ship to the sanctuary is very ancient. It can be traced back to pre-Christian times, when pagan belief taught that the offering of a miniature ship would assure a safe voyage for the real ship and its crew. Such a gift is called a "votive offering", and many a Viking family must have built such replicas of the ships on which their husbands and sons set sail. Bethlehem's ship was made by one of the early members of the congregation, Soren Madsen, as a replica of a ship which sailed for many years under the Danish flag. The model was three years in the making. The ship is generally placed in the rear or center of the nave, among the people, and pointed toward the altar, to represent the congregation's journey toward their heavenly home. As we enter God's family through baptism, we sail on through life's stormy seas together toward home.